Detail from Bestiary. London, British Library, MS Royal, 12 F. xiii, fol. 29r. 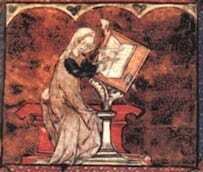 Bisclavret is one of the twelve lais in Marie de France’s collection, and there are also two closely-related versions amongst the other Breton lais which have survived: Biclarel and Melion (it was also translated into Old Norse as Bisclaretz lioð). 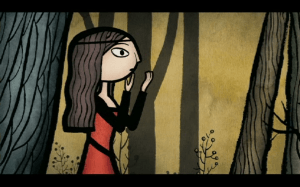 Clearly, this was a popular narrative, and it’s easy to see why; telling the tale of the shapeshifting werewolf Bisclavret, who is forced to remain in wolf form after his unfaithful wife hides the clothes which allow him to turn back into a man, this lai contains love, betrayal, dark tangled forests, and a gruesomely specific revenge in which wolf-Bisclavret bites off his former wife’s nose (incidentally cursing her female descendants with noselessness). It’s also a thought-provoking exploration of what it means to be human; do outward accoutrements of civilisation, such as clothing, make the difference between humanity and beastliness? Or should inner virtues, such as good manners, self-control and clear-headed thinking, be seen as more significant? Le neis li esracha del vis. Mut durement en ad grant hunte! 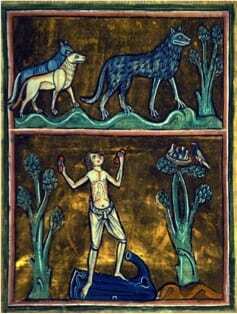 Bisclaret and its analogues is one of several werewolf tales circulating in the Middle Ages – others include the French romance Guillaume de Palerne (c. 1200) and the Latin Arthur and Gorlagon (13th/14th century) – and the notion of shapeshifting wolf-men clearly resonated with medieval audiences. 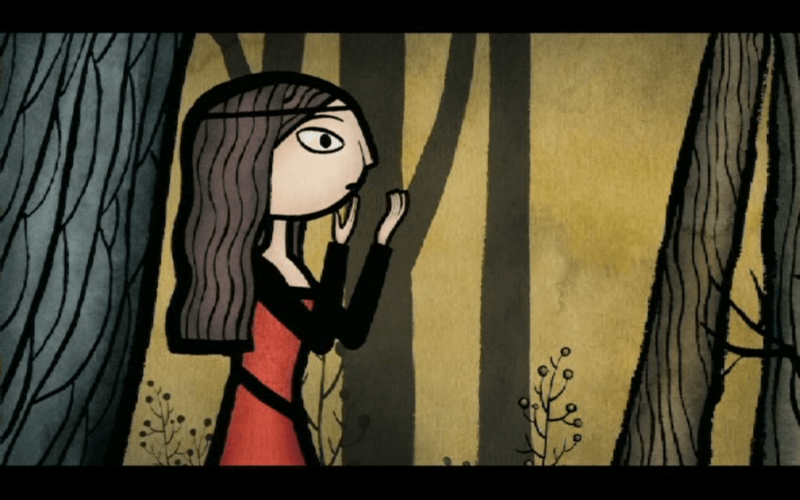 Many encounters with werewolves are presented as historical fact, such as that of the historian Gerald of Wales, whose treatise on the geography and folklore of Ireland, Topographica Hibernica (c. 1188) includes an account of a young boy and a priest who meet an elderly couple turned into wolves by a curse. Meanwhile, bestiaries of the period credited wolves with various unsettling qualities, including the ability to rob a man of his voice by looking at him (should this happen, the only way for him to save himself is to remove his clothes and bang two rocks together, according to authorities such as the Aberdeen Bestiary – the image above, from a British Library manuscript, illustrates this situation). Washington-based group Grendel Babies also have a song called ‘Wife of Bisclavret’, which retells the story from the wife’s perspective to a smokily jangling accompaniment of piano and screeching rock violin, adding a honky-tonk yowl to the multiplicity of voices which have retold the story from the twelfth century onwards. Meanwhile, the figure of the sympathetic werewolf continues to prowl through popular culture, appearing in Charlaine Harris’ Sookie Stackhouse novels and the hit HBO series True Blood they inspired, and – in perhaps the most pervasive sympathetic werewolf image of the past few years – Twilight, in which the relationship between a werewolf and his clothes is also given attention (happily, werewolves are revealed to have higher-than-average body temperatures when in human form, meaning that fewer clothes can be worn for convenient removal when shape-shifting; this also allows werewolves to carry their clothing with them, an innovation which would have saved Bisclavret a lot of trouble). What other latter-day Bisclavret figures are there?